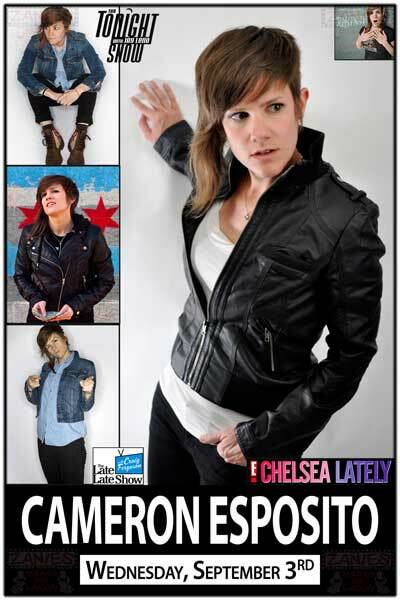 Called “the future of comedy” by none other than Jay Leno, Cameron Esposito is a fast rising Los Angeles-based standup comic, actor and writer. In addition to her work as a nationally touring headliner, Cameron has appeared on Late Late with Craig Ferguson on CBS, NBC’s Last Call with Carson Daly, IFC’s Maron, on Adventure Time on the Cartoon Network, and as a regular on E’s Chelsea Lately and Pivot’s TakePartLive. She has appeared at the SXSW, Moontower, Bridgetown, SF Sketchfest, and JFL Chicago comedy festivals, and will make her debut at Just for Laughs Montreal this summer. Named a Comic to Watch by LA Weekly, Time Out Los Angeles, and Cosmopolitan Magazine, Cameron hosts her own standup show, Put Your Hands Together, every Tuesday night at the famed Upright Citizens Brigade Theatre in Los Angeles, and has her own biweekly column about life as a standup comic on The AV Club. Cameron released her debut album, Grab Them Aghast, with Rooftop Comedy Records in 2010. Her second album will be released by Kill Rock Stars in fall 2014. Cameron hosts two podcasts - Put Your Hands Together, a podcast version of her popular standup show - and Wham Bam Pow, a scifi/action movie show distributed by Maximum Fun.